The Food and Drug Administration (FDA) released an advisory warning consumers against purchasing three unregistered household insecticides imported from China. 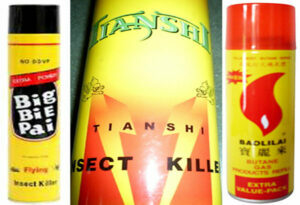 Big Bie Pai Aerosol Insecticide, Tianshi Insect Killer and Baolilai Aerosol Insecticide all contain cypermethrin, a highly-toxic synthetic compound found in many ant and cockroach killers, which can cause ill effects in exposed humans, pets and wildlife. 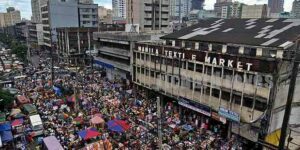 The issue is that these sprays were never evaluated for FDA compliance before showing up in places like popular Philippine market districts Divisoria and Quiapo. The FDA originally advised against a number of toxic, unregistered made-in-China products finding their way into the Philippines, despite a local ban, back in 2013, fearing their infiltration into the U.S. Last August, a three-year-old boy experienced vomiting, diarrhea and abdominal pain after accidentally exposing himself to Big Bie Pai Aerosol Insecticide purchased in Divisoria, according to FDA officials. “We’re appalled to witness such a brazen show of non-compliance that makes a mockery of our consumer health and product safety laws,” said Thony Dizon of the Philippine-based EcoWaste Coalition. On January 6, two members of the Philippine House of Representatives filed Resolution 1020, warning the public against buying nine “imminently dangerous” household insecticides, eight of them sourced from China, including the three referenced by the FDA. Regulatory officials have been advised by the FDA to conduct an inventory and seize all household pesticides lacking FDA registration.